The Scottish Government promised a revolution in access to information about schools. The BGE Toolkit is part of that and it is coming your way. A revolution in access to information in any sphere isn’t without concern because, like any professional group, educators have information which is necessary to support improvement but which could be wrongly interpreted or used mischievously by others. The fear isn’t about the sharing of the information per se but that the use of the data by others might lead to inappropriate action/reaction by the system which is not in the interests of pupils (e.g. waiting time data and resulting action in the NHS). This ‘revolution’ comes in two parts. The first is about information to the public and second is about improved information for use by schools to aid moderation, professional judgement and school improvement. Both of these rely on data provided by schools about the achievement of CfE levels and school level data about the characteristics of your pupil group. All this data is pulled from other systems which means there is no new reporting or data input required at the school level. We are pleased that the public-facing information is much more than a simple list of schools with the reported CfE levels. It contains much more information which goes some way to explaining a school’s situation and context. It is well presented and makes the data much more meaningful for anyone who accesses it. It also makes clear that the data used is still ‘experimental’ and cautions against making school to school comparisons. However, it is the professional-facing element of this latest BGE data related development that we are more interested in. This is the BGE toolkit. The toolkit is currently being distributed to schools with the plan that it should be available to schools via Glow after summer. Some of you will already have it and will be able to compare how your pupils are doing with the average performance of pupils with the same characteristics as yours. For those of you who have yet to get access to it, here is a short explanation of the context in which it sits and what insights the tool can offer. 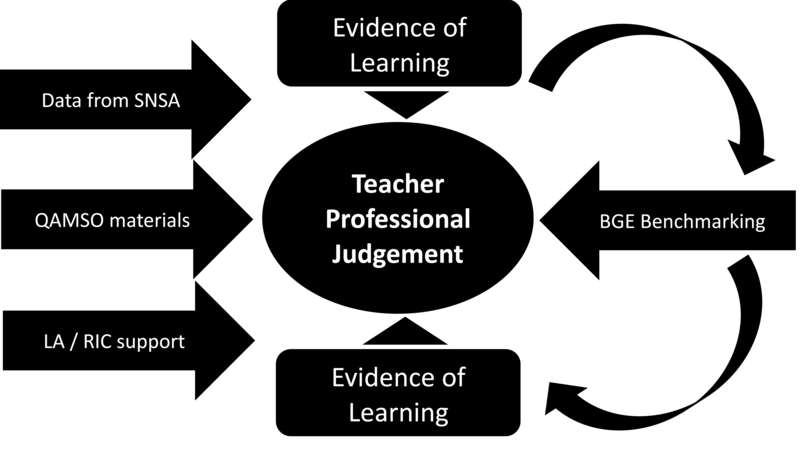 The first point of note is that the toolkit is simply one of several supports to inform teacher professional judgement about pupil progress (fig 1 and Key). Indeed, the tool simply reflects back to educators the information provided on pupil’s CfE levels. Its power is in the opportunities it offers to compare your school performance against schools with a similar pupil group – which will allow schools to make contact to share, compare and reflect on practice. • Show the achievement of children and young people in aspects of their learning in literacy and numeracy at the key points of BGE development (by P1, P4, P7 and S3) as evidenced through teacher professional judgement. • Provide a possible basis for comparing how schools have moderated teacher professional judgement in relation to national standards and other schools. • Show how children and young people within a school are achieving in relation to their peers across the country in schools with similar characteristics. • Provide information regarding the achievement of children and young people from different socio-economic backgrounds and with different characteristics (such as gender and ethnicity). A crucial message being presented alongside the provision of the tool is the need to look beneath the data as it can only go so far in telling the story of the school – the tool can only serve as a starting point for engagement and is not an end in itself.